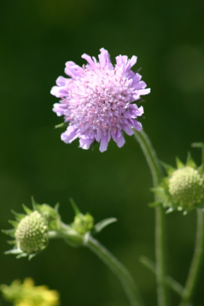 By now you probably know that not all noxious weeds look the part. Some are quite pretty. 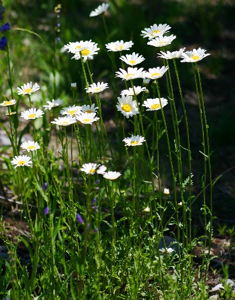 But weeds are not designated as noxious because of the way they look – it is the way they ACT that counts. Individually, these snapdragon-like flowers may look pretty. 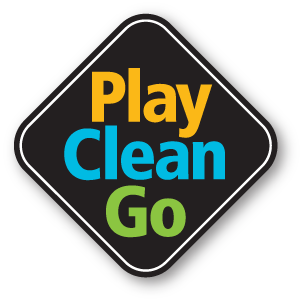 But if you let them loose on your property, you will most certainly NOT find them pretty for long. 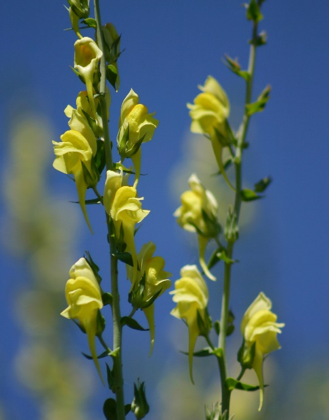 Dalmatian Toadflax and Yellow Toadflax (click to learn more) are two noxious weeds that have tricked many landowners into letting them onto their property because of their beauty. 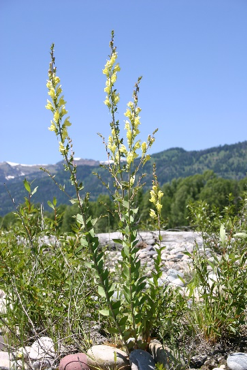 The yellow snapdragon-like flowers that the Figwort family is known for are an attractive addition to yards in Wyoming. They don’t require pampering either. 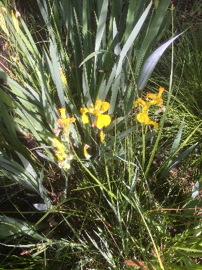 Before you know it, your entire property will be filled with these stout perennials and you won’t see much else. If either of the toadflaxes get to that point of coverage, your only option is biannual herbicide treatment with one of the few herbicides that these hardy species are susceptible to. 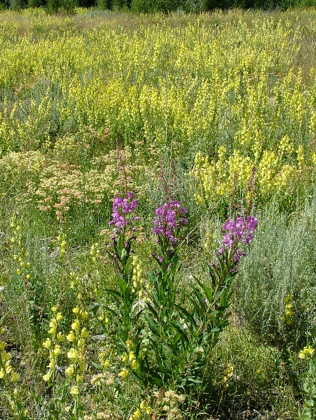 Yellow toadflax (left) and Dalmatian toadflax (right) have identical flowers but can be distinguished by their leaves. 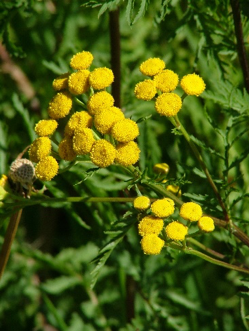 Dalmatian has broad waxy leaves while Yellow has long narrow leaves. 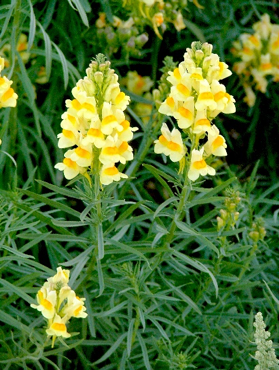 Why is toadflax consider noxious? 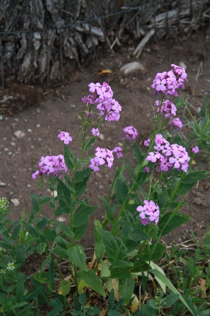 Remember, noxious weeds are given that designation because of how they act. Specifically, they cause harm to ecological systems and/or agricultural systems by invading established plant communities and replacing what was growing there, whether it was a crop or a native bunchgrass meadow. The twin toadflaxes are successful invaders due to their creeping perennial root system that allows them to steadily spread and squeeze out competitors. They are difficult to eradicate because their extensive root systems exclude mechanical control, their waxy leaves act as a barrier to foliar herbicides, and their long-lived seeds assure that they will be back, even if you do manage to kill them. What’s wrong with this picture? 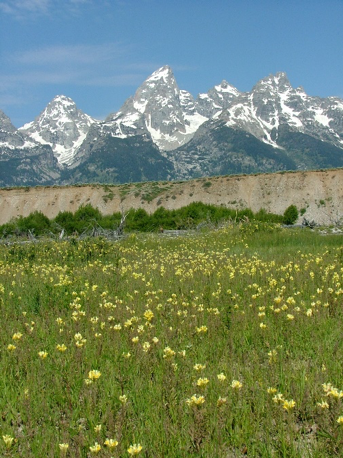 All the invasive Yellow toadflax in front of the Tetons! TCWP has found some success with herbicides containing Chlorsulfuron, as long as a good surfactant is used to help the aqueous solution penetrate the waxy leaves. We are also hopeful about Mecinus janthiniformes, a stem-mining weevil that is showing promise as a bio-control agent. 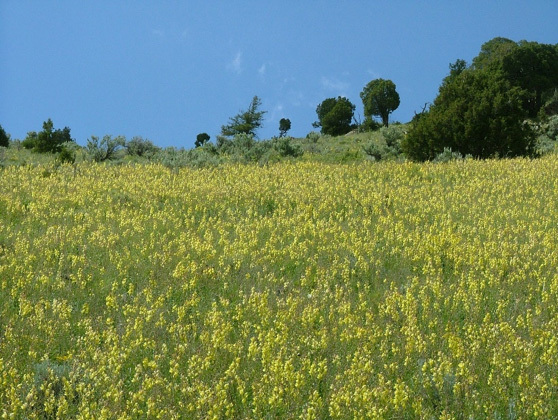 Bio-control is especially critical on the steep slopes in Teton County where toadflax likes to grow. 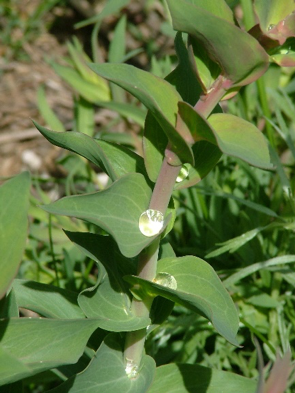 The waxy leaves of Dalmatian toadflax provide a barrier to most foliar herbicides. So next time you are looking for pretty flowers to decorate your yard, learn about their different personalities before you purchase. Aggressive plants may be easy to grow in the short-term, but they will cost you in the long-term when you are trapped in an indefinite biannual herbicide treatment schedule. Be aware of what you plant in your yard as well as what you already have growing there that might have moved in from outside. Bring any suspects into our office and we will identify them for you and let you know if you have anything risky. And remember, don’t judge a plant by the beauty of its flower. Other noxious beauties to look out for!